Data from"A Tabular Comparison of Notable Examples of Recent Locomotives", American Engineeering and Railroad Journal (June 1906), pp 224-225. See also Baldwin Locomotive Works Specification for Engines as digitized by the DeGolyer Library of Southern Methodist University, Vol 22, p. 200. Works numbers were 17439 in February 1900 and 17440, 17539-17540, 17574 in March. This were huge Camelback Consolidations that repeated the 677s of 1898-1899 (Locobase 5338), but had slightly longer tubes for even more heating surface area. Data from Baldwin Locomotive Works Specification for Engines as digitized by the DeGolyer Library of Southern Methodist University, Volume 41, p. 196. See also the Ligonier Valley Rail Road Association website at http://www.lvra.org, last accessed 8 March 2012. Works number was 33352 in April 1909. The LVRR measured 16 miles from the coal fields north of Ligonier to the Pennsylvania Railroad junction at Latrobe in western Pennsylvania. According to the LVRA, "It also connected the rest of the world with Pennsylvania's Mountain Playground, Ligonier Valley in general, and Idlewild Park in particular." During the 3/4-century operating life that ended on 31 August 1952, the LVRR moved 32 million tons of freight (mostly stone, coal, and coke) and carried 9 million passengers. The 15 served the Liggie from the time of its delivery to the end of its career, which ended in 1949. Data from Baldwin Locomotive Works Specification for Engines as digitized by the DeGolyer Library of Southern Methodist University, Volumes 41, p. 196; 51, p. 320; and 53, p. 387. Works numbers were 40944 in November 1913, 42630 in October 1915, and 43284 in May 1916. Essentially repeating the design found in LVRR 15, the latter Consolidations found in the current entry had four arch tubes that accounted for an additional 27.2 sq ft of direct heating surface area. The valve gear is described as "Walschaerts Improved". Data from Baldwin Locomotive Works Specification for Engines as digitized by the DeGolyer Library of Southern Methodist University Volume 19, p.14. Works number was 13783 in October 1893. This single camelback for the DS & S had a similar-sized boiler to those of the Vauclain compounds delivered to the Lehigh Valley in 1892 and described in Locobase 12030. This was a simple-expansion locomotive from the start, however, and had a small grate and firebox. It served the DS & S and successor Lehigh Valley for more than 30 years before being scrapped in June 1918. Data from Baldwin Locomotive Works Specification for Engines as digitized by the DeGolyer Library of Southern Methodist University Volume 19, p.124. Works numbers were 14038-14042, 14045-14047 in July 1894. Although small in the boiler, these Consolidations had relatively large grates. They were taken into the Lehigh Valley as part of the amalgamation of the two railroads and classed M-21 1/2. 611-614 had their trucks removed in September 1920, thus becoming 0-8-0 switchers, and renumbered 3000-3003. They were scrapped in November 1923 (3) and June 1924 (3000, ex-613). 615 was scrapped in 1925. 609 ended its career at the New River Company and 610 wound up at Dunn Loop Coal. Data from Baldwin Locomotive Works Specification for Engines as digitized by the DeGolyer Library of Southern Methodist University Volume 17, p. 261. Works number was 12643 in April 1892; 12650-12651, 12655. This Vauclain compound Consolidation camelback had 10 1/2" diameter piston valves. Later, the LV rebuilt this quartet as simple-expansion engines with 22" x 28" cylinders. 674-675 were scrapped in October 1928, 650 went in January 1930, and 651 closed out the class in March 1930. See also "The first Consolidation engine ever built ...", Railroad Gazette, Volume XVIII  (11 June 1886), p. 407. Mitchell's reasoning for adopting a 2-8-0 layout was to ease wear and tear on the track while more effectively distributing weight than an 0-8-0 could manage. Once Baldwin accepted the contract, Mitchell and Baldwin's William P. Henszey worked out the final details. Final cost was $19,000 plus 5% war tax. (In 1878, a Baldwin quote for a Consolidation was $9,700 -- obviously a deflation had hit the market.) The engine (with the satisfying round works number of 1500) was delivered in August 1866. The engine experienced overnight success by managing loads up 2.5% grades equal to the 0-8-0s (100 empty coal cars totalling 340 trailing tons), but with less chance of derailment or damage to the tracks and at a higher speed. White (1968) says that little is known about Consolidation's service history except that she ran 377,000 miles before her retirement in 1886. The 1886 RG account gives some details about her service in a review. Its maximum train load over a 96 ft/mile (1.8%) grade consisted of 130 empty coal cars weighing 442 tons (402 metric tons). RG's calculations of the probable resistance of such a load worked out a factor of adhesion close to the FofA shown in the specs. The Consolidation remained in service for 19 years 10 months and averaged 19,000 miles (30,590 km). Its boiler life was shortened by the "unavoidable use of sulphur water". Its first boiler was replaced in May 1875. Deterioration of the second boiler and "weakness of frame and pedestals" led to its abandonment in May 1886. Data from DeGolyer Library of Southern Methodist University Specifictions for Engines, Volume 14, p. 9. Works numbers were 9056-9062 in February 1888, 9119-9132 in March; 12278-12282, 12284-, 12285, 12287, 12293, 12298 in October 1891; and 12621, 12626, 12628-12630, 12634 in April 1892. 450-460 were named when they first arrived on the LV. In road number order they were Enterprise, Mill Creek, Warrior Run, Espy Run, Slocum, Glen Summit, Penobscot, Bear Creek, Moose Head, Beauplana. Later locomotives bore numbers only: 603-607, 593-596, 628-633. Data from DeGolyer, Volume 22, p. 110; and Volume 24, p. 30. 16588-16589 in March, 17090-17095 in September; 17139-17141, 17201-17214 in October. These Vauclain compound engines had relatively tall drivers for Consolidations of the time and served on the Buffalo Division where the grades averaged 20 ft to the mile (<0.5%) and were 35 miles long. The first fifty trailed tenders that carried 4,500 US gallons (17,033 litres) of water and weighed 100,000 lb (45,359 kg) loaded. Soon after delivery of the final batch of compounds, the LV began converting the class to simple expansion. See Locobase 7304 for the result when these engines were also superheated later on. Data from Baldwin Locomotive Works Specification for Engines as digitized by the DeGolyer Library of Southern Methodist University, Volume 24, p. 230. Works numbers were 20350-20351 in April 1902; 20406-20407, 20424, 20443-20444, 20461-20463 in May; 20524-20527, 20562, 20564-20565, 20605-20607, 20627-20628 in June; 20663-20665 in July. Very similar to other camelback Consolidations delivered to the Lehigh Valley at the turen of the century, this set had longer boiler tubes and a slightly smaller grate. All of therm were rebuilt by Baldwin, who installed simple-expansion cylinders and superheaters, in 1915; see Locobase 7304. Data from DeGolyer, Volume 23, pp. 50+. These Vauclain compound engines were identical to the Consolidations described in Locobase 4896 except for the smaller drivers, which suited them for the steeper grades in the anthracite region. Data from LV 3 -1934 Locomotive Diagrams supplied in May 2005 by Allen Stanley from his extensive Rail Data Exchange. 102 camelback Consolidations comprised this large class that was originally delivered as Vauclain compounds in 1899 to 1902 (see Locobases 4896 and 16159). Only three years later they were converted to simple expansion and, beginning in 1914, fitted with superheaters and piston valves. As one might guess of one of the most numerous classes on the LV, retirements covered a long period. The first went in 1916 (possibly an accident victim?) and the last held out until 1951. Five years after Baldwin delivered its big batch of camelback Consolidations (Locobase 7304), Alco followed with twenty more simple-expansion engines in 1907 with the same-size grate but a bigger boiler. Beginning in 1916, some were fitted with superheaters and piston valves. Retirements of this class began in 1928 and were completed 17 years later in 1945. Data from table in AERJ July 1903, supplemented by Baldwin Locomotive Works Specification for Engines as digitized by the DeGolyer Library of Southern Methodist University, Volume 21, p. 272. Works numbers were 16690-16694 in April 1899, 16775-16778 in May. Gene Connelly's list shows this set of Consolidations with simple-expansion 23" cylinders, but the Baldwin specs documented above show that all were ordered with the same Vauclain compound arrangement first installed on the 681 (Locobase 9934). 13" piston valve fed steam to the HP/LP combination on each side. If they were delivered as compounds, the M-37s adopted the 23" x 30" simple-expansion layout. They were all renumbered twice, ending up with 950-964. All but one retained their 2-8-0 configuration. 950 was converted to a large 0-8-0 switcher in 1906 and given number 3199 and class ID L-6. 953 and 959 were scrapped in September 1925, 958 in February 1930, and the rest in 1932. Data from "Lehigh Valley's Latest Consolidation Engine", Locomotive Engineering, Vol XI, No 12 (December 1898), p. 539. See also Baldwin Locomotive Works Specification for Engines as digitized by the DeGolyer Library of Southern Methodist University, Vol 21, p. 272. Works number was 16224 in September 1898. One of the Vauclain compound Consolidation locomotives supplied to the LV by Baldwin in 1898 (Locobase 5338) experimented with increasing the low-pressure cylinder diameter to 30". It offered considerable power. It was guaranteed by Baldwin to pull a 1,000-ton train up a 1.6% (1 in 61) grade at 17 mph. The production variant of this class, shown in Locobase 5338, had the same power dimensions, but reduced the number of tubes by nine. Like the other Vauclain camelbacks, this engine was later rebuilt in a simple-expansion configuration; the shops fitted 681 with 23" x 30" cylinders. It was scrapped in September 1925. Data from George L Vose, Manual for Railroad Engineers and Engineering Students (Boston: Lee & Shepard, 1883), pp. 402-403. See also DeGolyer, Volume 5, p. 269. Baldwin works numbers were 2587, 2588 in October 1871; 2679, 2682 in January 1872; 2699, 2701 in February; 2733, 2742 in March. With the success of the original Consolidation assured (Locobase 2556), the Lehigh Valley bought a few more of the same with slightly larger dimensions. This pair - named Mogul and Tycoon -- had slightly less heating surface area but more tubes. Six more followed with state names: Maryland, Virginia, Carolina, Georgia, Florida, and Alabama. In its catalogue, Baldwin reprinted an 8 May 1878 letter from James I Blakeslee, Division Superintendent, in which he wrote: "Engine No. 169 ...came on this road March 1872, and in the first five years made a mileage of 112,008 miles [181,610 km]. The cost of repairs during the five years was $3,739.50, equal to 0.3 1/3 cents per mile. Average number of empty cars on a grade of 96 feet/mile [1.8% grade] 100 [3.8 short tons each or a total of 380 tons]. Average number of loaded cars on a grade of 130 feet/mile [2.5% grade] 30 [loaded 10.5 short tons each or a total of 315 tons]." "An engine of this class.. has drawn 17 cars, 8 tons each, or 136 tons, exclusive of engine and tender, over a 133 feet grade [2.5%], at about 8 miles an hour [13 km/h], with 120 pounds of steam, cut off at the fifth notch, using no sand, and in a snow-storm, on a bad rail." Pause to imagine the cold and poor visibility the crew encountered on that run and reflect on the fact that some of the men were outside on the cars. "With a dead pull at the bottom of a 77 feet grade [1.45%], [the engine] took 504 tons up the grade and around a 90 [not sure if degree or foot radius]curve, with 125 pounds of steam, cut off at 20 inches." They were rebuilt in 1882. 165-167 were scrapped by 1905. 170 was fitted with Wootten firebox in 1889 and scrapped in April 1912. 168-169 were designated class M-25 and carried on until 168 was broken up in May 1913 and 169 dismantled in September 1915. Data from Baldwin Locomotive Works, International Exhibition 1876, Exhibit of Locomotives by Burnham Parry Williams & Co (Philadelphia: J P Lippincott & Co, 1876), pp. 8-12. See also DeGolyer, Volume 7, p. 333. Works number was 3862. Locobase 2256 describes the very first "Consolidation" and Locobase 9678 shows the confusingly named "Mogul", an 1871-1872 variant; this entry describes the exhibit specimen built for the 1876 Centennial Exposition in Philadelphia. 310 had a larger firebox for burning anthracite coal, but was otherwise similar to the Mogul. Headlight, Kelly Lamp Works [Rochester, NY]. Another little tidbit from Baldwin's recitation of the Consolidation's power that spotlights average freight weights: In describing the 35-car train of loaded coal cars, the builder notes that the tare weight of each car is 3 tons 8 cwt (7,616 lb) and a coal capacity of 6 tons (13,440 lb). Taken together, that's a loaded weight per car of 10 1/2 short tons or 9.4 long tons. 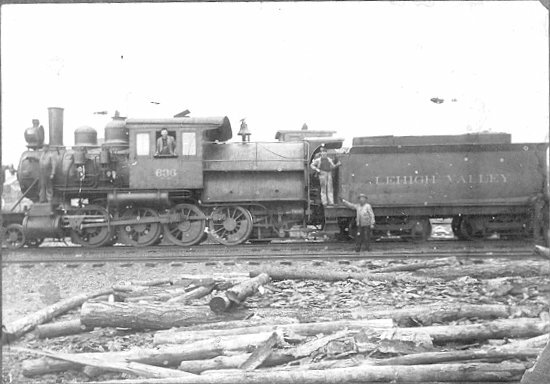 The LV rebuilt the 310 with a Wootten firebox in January 1892 and classified it M-18. It was scrapped in March 1928.